New England Patriots quarterback Tom Brady has ranked near the top of the MVP race all season, but it doesn’t seem like anyone is too excited about his candidacy. First, Philadelphia Eagles QB Carson Wentz was the front-runner, but his season was cut short by a knee injury. Pundits next turned to Seattle Seahawks signal-caller Russell Wilson, but the Seahawks failed to make the playoffs behind uneven offensive performances. For a while, buzz surrounded Pittsburgh Steelers wideout Antonio Brown, but Brown missed the final two games with injury. Lately Los Angeles Rams running back Todd Gurley has emerged as a viable option. Perennially excellent and almost-as-perennially-snubbed New Orleans Saints QB Drew Brees, who led the NFL with a 72.0% completion rate on one of the NFC’s best teams, must be wondering what he has to do to get in the conversation. Brady has been one of the top two options all season, but the media seems to be seeking any excuse to find someone else to hand the award to. As one of ITP’s resident Patriots fans, I seek to convince you, dear reader, that not only does Brady deserve the award, but that he’s a quality candidate who we should be happy to honor, not seek alternatives to. I will try not to be too much of a homer. First, let’s start with the numbers. Brady led the NFL in passing yards with 4,577. He ranked third in passing touchdowns with 32 and was only intercepted eight times. Brady’s passer rating ranked third at 102.8. Prefer advanced stats? He’s first in Expected Points Added, fifth in ANY/A at 7.56 (a stone’s throw behind #1 Jared Goff at 7.72), third in ESPN’s QBR behind Wentz and Minnesota’s Case Keenum, first in Football Outsiders’ DYAR (and second in DVOA), and first in Bleacher Report’s NFL 1000 QB rankings. He has the strongest statistical case of any of the quarterbacks, and since QB is the most valuable position in the game, that automatically makes him a front-runner for the award. No, it hasn’t been a historic statistical campaign like Peyton Manning’s 2013, Aaron Rodgers’ 2011, or Brady’s own 2007, but it has been excellent. Brady hasn’t disappointed in the clutch, either. He led a touchdown drive late to beat the Houston Texans in Week 3 in a game where the defense floundered against rookie sensation Deshaun Watson. He led another fourth-quarter rally in Week 4, tying the game with two fourth-quarter touchdown drives against the Carolina Panthers before Carolina won the game on a last-second field goal. In the biggest game of the year, he led a touchdown drive with two minutes remaining to take the lead against the Pittsburgh Steelers. The Patriots are 13-3 and Brady’s heroics are a big reason why. To my mind, however, a lot of Brady’s case rests not on gaudy stats or heroics. When the Patriots are humming, they play what head coach Bill Belichick calls “complementary football.” Complementary football is the idea that what the offense, defense, and special teams do impacts the other units. A timely turnover by the defense can set up great field position for the offense. Effective punt and kickoff units can set up long fields for the defense to defend. Early in the Patriots dynasty, it was often the star-studded defense making things easier for a young Brady and a no-name receiving corps. Over the last decade, however, veteran defenders like Ty Law, Willie McGinest, Richard Seymour, Tedy Bruschi, Rodney Harrison, and Mike Vrabel left, traded, or aged out, and offensive weapons like Rob Gronkowski, Wes Welker, Julian Edelman, and this year, Brandin Cooks, became the focal point of the team. The excellence of the offense makes things easier for a defense that has often struggled. If you’re not used to looking at drive data, this may not seem remarkable, but there’s a lot going on here. First, each team punted on two of their first three drives – then there were no punts the rest of the game. Second, there were very few drives in this entire game – just eight for each team, and each team had an end-of-half drive where it wasn’t trying to score. Three, the Patriots scored on five consecutive drives between the end of the first quarter and midway through the fourth; basically, after those two initial punts, they scored every time they touched the ball. Four, the Falcons had a whopping four drives – half of their possessions – where they moved the ball substantially but either turned the ball over on downs or missed a field goal. What does this have to do with complementary football? It’s important to note that while putting up 23 points sounds mediocre, putting up 23 points on only eight drives is excellent. The average NFL offense got 11.5 drives per game in 2017, so 23 points is about the equivalent of 33 points in a “normal” game. 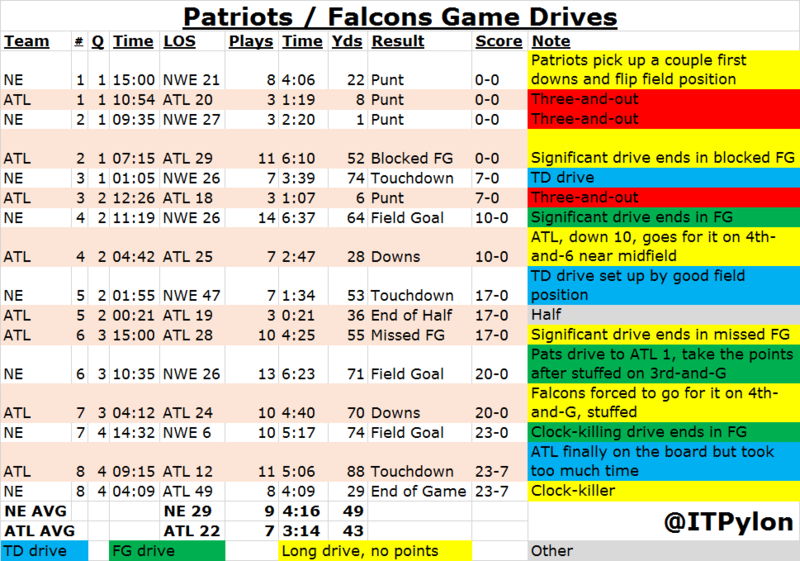 The small number of drives limited the opportunities for Atlanta to score, too; the Patriots D was only on the field for 57 plays despite giving up a number of long drives themselves. The Patriots scoring repeatedly meant they were kicking off, and they buried Atlanta with lousy field position all day, never starting better than their own 29 and three times starting inside their own 20. New England’s lead effectively took away Atlanta’s running game – even though running back Devonta Freeman averaged 6.0 yards per carry, he only got the ball 12 times. And the Falcons, perhaps pressured by New England’s offense, attempted to convert three fourth downs, failing twice. This is what the Patriots have done all year. Only two teams had fewer offensive drives, yet the Patriots rank second in points and first in yards. They rank first in yards per drive, points per drive, and plays per drives. They score on just under half of their possessions, the best figure in the NFL, and only the Chiefs have turned the ball over on fewer of their drives. This makes the defense look good. The Patriots rank fifth in scoring defense, but a lot of that is propped up by the offense. They’ve seen the fourth-fewest drives. Opposing offenses have the worst starting field position in the league by a full yard, almost four yards worse than league average. New England routinely plays with a lead that makes opposing offenses one-dimensional, and sometimes forces risky plays. Combine these favorable circumstances with the classic Bill Belichick “bend-but-don’t-break” red zone D, and you’ve got a recipe for a defense that ranks 31st in yards per drive allowed and in DVOA, but top-five in points allowed. Is Brady’s candidacy perfect? As stated above, it was not a statistically dominant campaign. Brady did not close the year in strong fashion, throwing interceptions in five consecutive games from Week 12 to 16. He especially struggled in two games Gronkowski missed, as the offense put up only 19 and 20 points against Tampa Bay and Miami, respectively. Even these issues can be explained away, however. Brady did throw picks in five straight games, but multiple interceptions only once, and he only threw eight for the season. Brady’s touchdown passes were down late in the season, but that was largely a function of running the ball close in to the goal line; they still averaged 28 points per game over the final six weeks, going 5-1. And Brady has struggled without Gronk, but it’s important to have context for this. Top 2016 receiver Julian Edelman has missed the whole year, as has third receiver Malcolm Mitchell. Starter Chris Hogan has missed half the season. Gronk’s backup Dwayne Allen has struggled in the passing game, as has depth wideout Phillip Dorsett. So the weeks where Gronk is missing, he isn’t the only one missing; it is a shallow group with all the injuries. 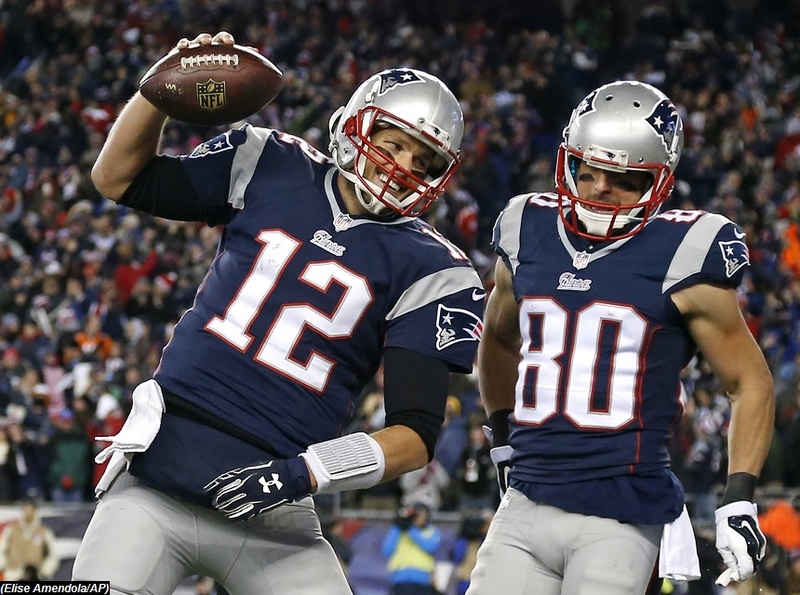 Ultimately, the biggest knock against Brady’s MVP candidacy seems to be that it’s boring. There’s no obvious narrative here – Brady and the Patriots were expected to be really good, and they are. Brady doesn’t have a story like the emergence of Wentz and the Eagles or the rejuvenation of the Rams, nor does he make many of the flashy, crazy scramble plays Wilson makes. Brady’s case is still compelling, however: he’s running the NFL’s most efficient offense, and that makes the Patriots better on both sides of the ball. That’s not new, or flashy, but it sure is valuable. At the end of the day, that makes Tom Brady the NFL’s MVP. As Skip Bayless puts it (I know, I know, but still), “degree of difficulty.” Wentz has a stacked, multi-dimensional team. I believe that Gronkowski was the only Patriot (other than Brady) on offense or defense that finished in the top 10 in any significant statistical category. Even sports journalists couldn’t name half of the healthy Front 7 coming down the stretch. Given the amount of yards the defense surrenders, and the fact that players like Burkhead and Amendola are considered major threats for this offense, this Patriots’ team is probably 5 games in the standings better than it should be. As to the case for Wilson, all he does is scramble around and either run or heave the ball 50 yards down the field and hope the receivers have gotten open by then. Of course he is going to be responsible for most of the team’s offensive production when that is the offense.